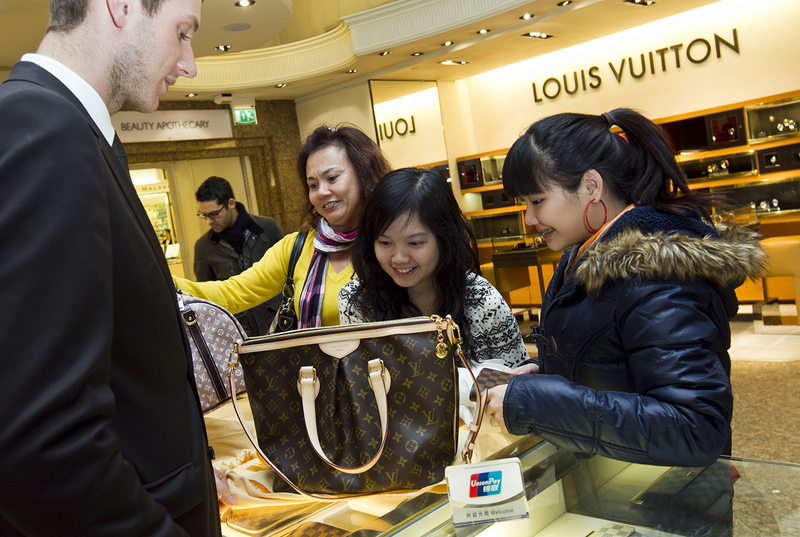 Shoppers make a purchase using a UnionPay debit card at Harrods department store in London, February 3, 2011. By Wu Hongyuran and Leng Cheng. This article was first published by Caixin. China is stepping up supervision of the use of bank cards overseas, a move the foreign-exchange regulator says is needed to fight money laundering, terrorist financing, and tax evasion. Starting September 1, banks will be required to report on a daily basis all cash withdrawals made via overseas ATMs and spending of more than 1,000 yuan (U.S.$147) made abroad with domestically issued bank cards, the State Administration of Foreign Exchange (SAFE) said on Friday. The administration said the new rules are aimed at combating illegal activity and do not represent a change to current foreign-exchange policies, seeking to address concerns that the move is part of its campaign to curb capital outflows. Chinese people spent more than U.S.$120 billion overseas through their bank cards in 2016, making it increasingly necessary to “improve the transparency and quality of statistics on cross-border transactions," SAFE said. Banks who fail to comply with the rules will be subject to “regulatory measures and punishment,” the administration said, without giving details. A source close to the regulator said the new rules are aimed only at gathering information about Chinese people’s overseas spending and it can’t be inferred that this will lead to any adjustment in foreign-exchange policies. “More than 80% of transactions involve spending of less than 1,000 yuan, which means the majority of the spending data won’t need to be reported,” the source said. The data gathering will take place between the regulator and the banks, and will have a limited effect on card holders, he said. SAFE’s announcement comes amid a campaign by authorities to boost oversight and control of foreign-exchange transactions by companies and individuals as a surge in capital outflows forced the central bank to use its foreign-exchange reserves to prevent the yuan from falling as demand for dollars and other currencies jumped. The reserves fell for seven consecutive months up to January 2017 to under $3 trillion, a level analysts have said is a psychological “red line” for the government. But they have recovered slowly since February as a result of the tightened supervision and amid waning expectations for yuan depreciation. Individuals in China are allowed to change the equivalent of up to U.S.$50,000 from yuan into foreign currencies every year under a quota system that renews every January. Overseas spending on bank cards isn’t included in the quota provided the debt is repaid from a yuan-denominated domestic bank account. The new rules are being widely interpreted as the beginning of a process to close loopholes that allow card holders to move money offshore. A manager with a foreign bank told Caixin that some shops in Macau allow visitors from the mainland to buy watches and jewelry using their bank cards and then repurchase the goods for cash. Another practice, known as “ants moving their house,” involves individuals making multiple ATM withdrawals overseas to transfer large amounts of money offshore, he said.